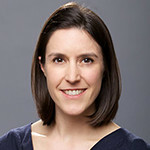 Julia Fox is the Senior Director of Corporate Collaborations for HeartFlow, a medtech company leveraging non-invasive imaging and deep learning algorithms to transform the way heart disease is diagnosed and treated. Julia previously developed new products, services, and strategic alliances in R&D, Marketing, and Business Development roles at Stanford University, Abbott Vascular, and Siemens Healthineers. Julia was a Fulbright Scholar at the Aarhus University Hospital in Denmark, and earned her BS in Biomedical Engineering from Johns Hopkins University, and MS and PhD degrees in Mechanical Engineering from the University of California at Berkeley.